New patients, please download the new patient forms and policies here. Please print, fill out, and sign all necessary documents and bring them with you to your first appointment. If you have any questions, please feel free to call or email us. 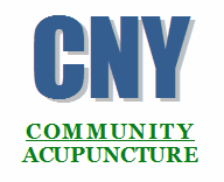 IMPORTANT NOTE - CNY Community Acupuncture does not have handicapped access. If you are unable to use stairs, please call Kari at 315.925.8888 to book your appointments so that we may make arrangements to treat you in a room with access. Appointments last About an Hour. The 15 minute acupuncture appointment time showing below is simply a placeholder. Your appointment can last anywhere from 40 minutes to 1 1/2 hours and is based on the length of time you need to rest and complete your treatment. Click on the "Book Now" Button to begin making your selection. ​Only available times are shown.